Apple has a new partner in crime. Sorry, new partner in fashion tech. A new luxury fashion house, this time the French company Hermès. 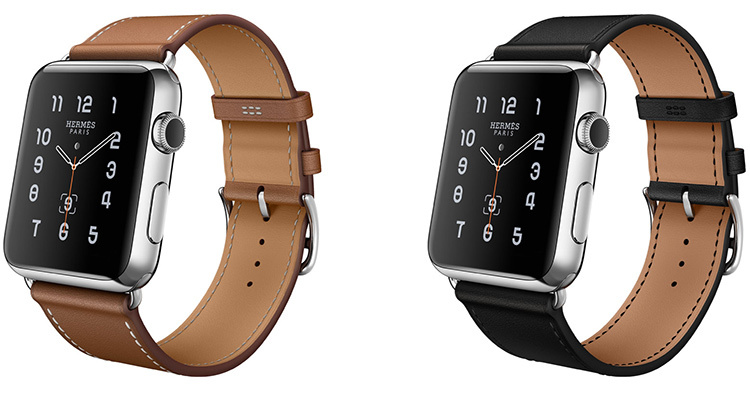 Apple and Hermès announced today, 9th of September 2015, a new collection of Apple Watch, called Apple Watch Hermès of course. Since its inauguration in 1837, more than six generations of aspiring and dedicated artisans, Hermès is widely regarded as one of the most exclusive luxury fashion brand. 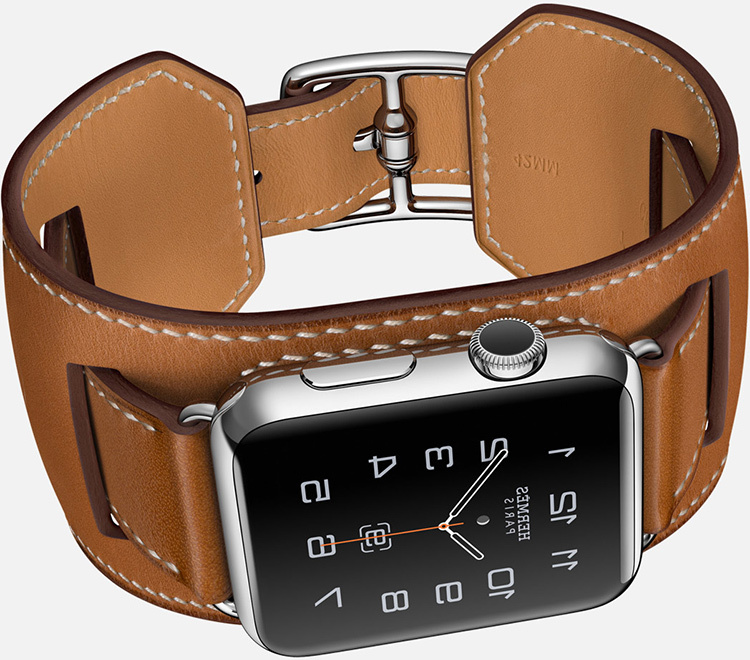 The new Apple Watch Hermes collection is made in stainless steel casing with finely designed leather wristbands in unique patterns from Hermès, named the Single Tour, Double Tour and Cuff, while maintaining the form and functionality of the Apple Watch. The partnership combines Apple’s exceptional product innovation with the tradition, image and craftsmanship of Hermès, creating a unique expression of Apple Watch. “We are strongly united by the same deeply held ideas and principles. I see it as the establishment of an alliance in excellence; like horse and carriage, a perfect team.” said Pierre-Alexis Dumas, Hermès’ executive vice president in charge of artistic direction. Expected to launch next month, on the 5th of October, Apple Watch Hermes Edition will be giving the buyers a choice of three band styles: Single Tour, Double Tour and the Cuff. Apple Watch Hermes, Single Tour, 38mm for women. Left to right: Fauve Barenia Leather Band, Noir Leather Band and Capucine Leather Band. This is a single loop leather bracelet for the new Apple Hermes Watch, that comes in 3 colours for women and 2 colours for guys. The bracelet on the women version is thinner, designed for the smaller watch, the 38mm. In the pic above we see the Single Tour, released for women and named – from the left to the right – Fauve Barenia Leather Band, Noir Leather Band and Capucine Leather Band. 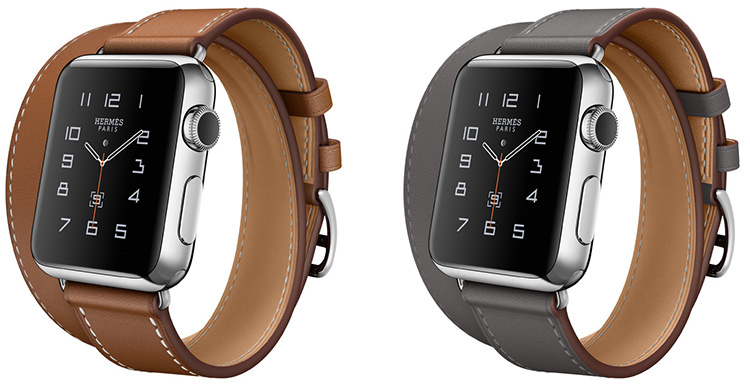 The single loop leather bracelet for the new Apple Hermes Watch, also comes in a “for him” version. It was released in just two colours as apparently we guys don’t like red; sorry, capucine. The bracelet on the guys version of Apple Watch Hermes is – as expected – slightly thicker, especially designed for the 42mm apple watch. In the pic above, from left to the right: Fauve Barenia Leather Band and Noir Leather Band. Starting at $1100. 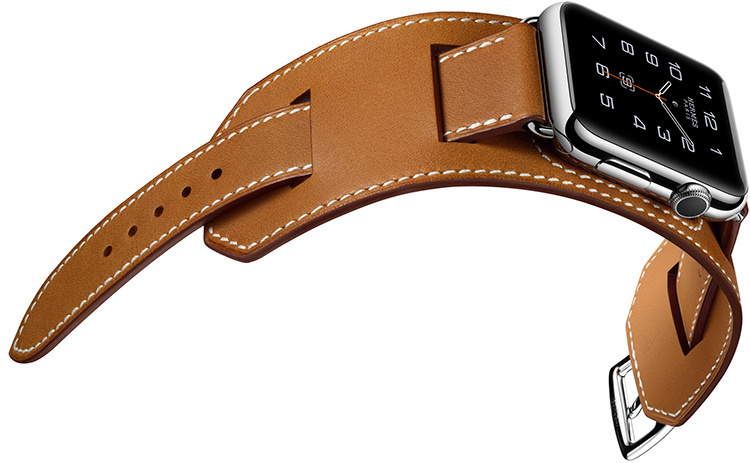 The Apple Watch Hermes Double Tour is – in my opinion – the most feminine bracelet design from the lot. It comes as a double loop and – surprise, surprise – it was released only with the 38mm face. 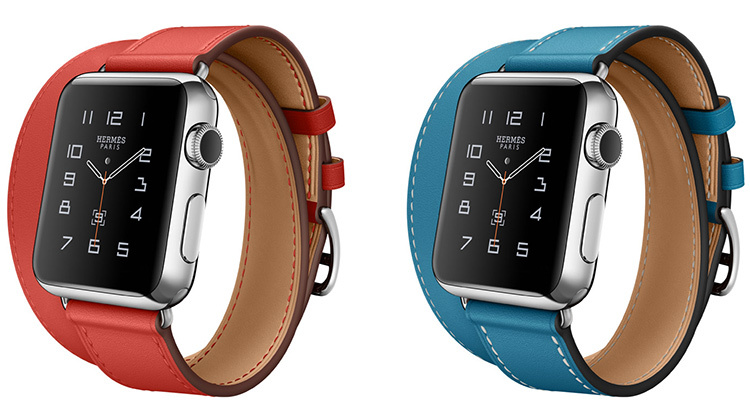 The bands are available in four colours of leather: brown, grey, red and blue. Or as Apple calls them, Fauve, Etain, Capucine, and Bleu Jean. One sale for $1250. Inspired by equestrian fixtures, the finely crafted modern Cuff in Hermès’ trademark leather is designed in a beautiful way to allow the heart rate sensor to keep in touch with the wrist. Accessible in a gorgeous 42mm stainless steel case with an Hermès leather band in Fauve. Brown. On sale for $1500. Definitely designed with the “wild ones” in mind. The rebellious one. A Rock’n’Roll fashion style. And so on. I personally like it a lot and I just wish it was black with some metallic studs. 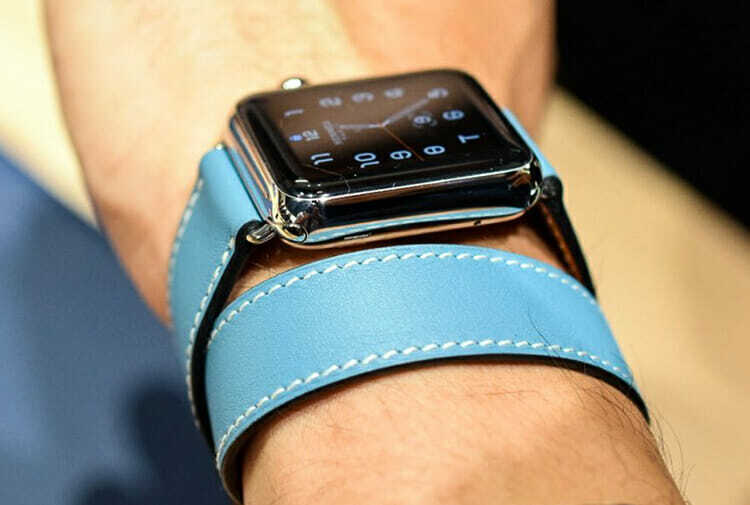 The Apple Watch Hermes, which will go on sale starting the 5th of October and the price will range from £800 to £1200, giving the buyers a choice of three band styles: Single Tour, Double Tour and the Cuff. The Apple Watch Hermès collection will be available at select Hermès retailers and select Apple Stores in Australia, Japan, Canada, China, Russia, France, Germany, Switzerland, Hong Kong, Italy, Korea, Singapore, , the UK and the US. For more information about the collaboration between Apple and Hermès you can visit the official Apple-Hermes website here.